Do you want to make the most out of your trip to the Cochise Stronghold? Have you been waiting for years to finally get on ALL the amazing climbs you have heard rumors about? Get both books (East Side and West Side), housed in a stunning slipcover, to add to your climbing quiver. With this vast and expansive area the best way to maximize your time is this comprehensive set with almost 1000 multi-pitch routes. You can pick you grade, style, and aspect, as these books have it all! ​This is the book you have all been waiting for. A completely new design from the West Side book, this full-color book features: aerial photography, highly detailed descriptions, stunning action shots, and will reveal all the mystery routes. Hundreds of multi-pitch granite adventures ( ABOUT 475+)on the premier domes of the Stronghold fill this book. From Entrance Dome to Polychrome Dome, with the Rockfellow Group sandwiched in between...It even includes the Lost Canyon. Where is Lost Canyon? These never before published routes will satisfy every climber. 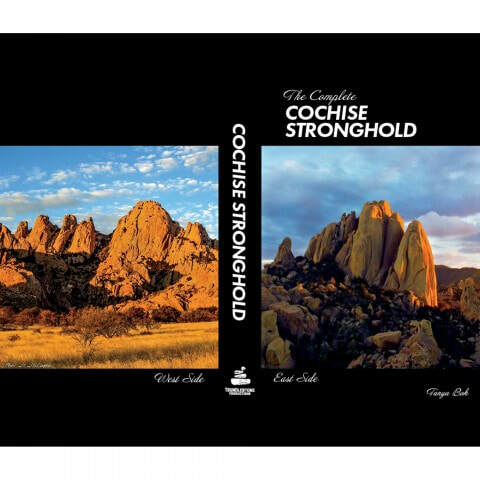 ​ The first ever guide to the West Side of the Cochise Stronghold. This book contains 350+ routes and 500+ pitches of climbing. Many of which have never been published before and some have never been repeated. With all this information you are finally ready for the perfect winter rock climbing road trip. Full color, historical antidotes, inspiring photos to get you on the best routes Southern Arizona has to offer. By submitting your information for any reason on this website you are automatically giving permission to be added to our contact list. If you do not wish for this please indicate at the bottom of your submission. All material and photos on this site are copyright protected. They may not be reproduced without the permission of Trundlestone Productions.